Aston Villa outclassed hard-working League One side Brighton to ease into the fifth round of the FA Cup. 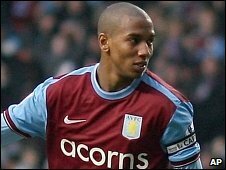 Villa took the lead after five minutes when Marc Albrighton found Nathan Delfouneso who side-footed home. However, the Seagulls stunned Villa Park when Tommy Elphick equalised with a scruffy finish at the near post. Ashley Young's header from Stewart Downing's cross put Villa back ahead and Fabian Delph added a third before Nicky Forster made it 3-2 late on. With 56 places between the two sides on the league ladder, the six thousand Brighton fans who made the trip to Villa Park did so more in hope than expectation. And those hopes were dented almost immediately by the Premier League side when Marc Albrighton, making only his second start for Villa, danced past the defence and handed Delfouneso a tap in from two yards. Unfortunately for Albrighton, a knock picked up during that run forced Villa boss Martin O'Neill to replace him with James Milner moments later. O'Neill had originally looked to rest Milner, making six changes from the side which overcame Blackburn 6-4 in the Carling Cup semi final in midweek. And although they took the lead, the much-changed Villa side showed they might be susceptible to an upset when Brighton, 21st in League One, missed a fine opportunity to level. Villa failed to defend a free-kick from Alan Navarro and the ball fell to striker Glenn Murray who volleyed over the bar from eight yards. Five minutes later the Seagulls did shock the home side when Elphick equalised. Villa failed to deal with a second corner in quick succession from Elliott Bennett and Elphick squeezed his shot inside the near post. Immediately after half time Villa, who are seventh in the Premier League, reasserted their superiority when Downing's cross found Young who headed home from close range. Delph could have increased the lead but his drive was saved at point blank range by Brighton goalkeeper Michel Kuipers. But the 19-year-old did not have to wait for too long before he had another opportunity to open his Villa account and this time the youngster capitalised. The midfielder, who has only featured for Villa nine times since signing from Leeds last August, latched on to Milner's through ball and calmly slotted the ball past Kuipers with his left foot. Delfouneso hit the post with a rasping effort at the end of a fine individual 30-yard run as Villa looked, in vain, to add the fourth. And it was Brighton who managed to make the final seconds tense when Forster drove his finish low into the bottom corner, but the dream comeback was not to be. "Can we reach two cup finals this season? We are certainly going to try. We've reached one already and now we're in the fifth round of the FA Cup. "Of course, you need some luck with the draw and a lot of things can happen in cup matches which are one-off games. "But if the quality players we've got here stay fit, there is no reason why we shouldn't try and achieve the double." "We put everything into the game and the fans were absolutely fantastic. "We made a couple of mistakes and paid the price for that, but we showed during this game that we can compete with better players. "I was never going to come to Villa Park and try and play for a 0-0 and be boring. "That is not my style. I wanted to come and entertain and the boys can be proud of their efforts." 90:00+2:30 The referee ends the match. 90:00+1:51 Booking Liam Dickinson goes into the referee's book. 90:00+1:47 Liam Dickinson concedes a free kick for a foul on Ciaran Clark. Direct free kick taken by Bradley Guzan. Correction - 90:00+1:47 Ciaran Clark fouled by Liam Dickinson, the ref awards a free kick. Bradley Guzan restarts play with the free kick. 90:00+0:41 Jim McNulty provided the assist for the goal. 90:00+0:41 GOAL - Nicky Forster:Aston Villa 3 - 2 Brighton Nicky Forster gets on the score sheet with a goal from inside the area to the bottom left corner of the goal. Aston Villa 3-2 Brighton. 88:41 James Milner produces a right-footed shot from the edge of the area and misses to the left of the target. 87:49 Inswinging corner taken left-footed by Stewart Downing, Curtis Davies takes a shot. Save by Michel Kuipers. 87:38 Stewart Downing takes a shot. Tommy Elphick gets a block in. Correction - 85:50 Substitution Shane Lowry is brought on as a substitute for Ashley Young. 85:50 Substitution Ciaran Clark joins the action as a substitute, replacing Ashley Young. 85:26 Nathan Delfouneso produces a right-footed shot from just outside the box that hits the post. 83:28 Steve Sidwell takes a shot. Save made by Michel Kuipers. 82:10 The ball is sent over by Stewart Downing, clearance made by Jim McNulty. Ashley Young takes a outswinging corner from the right by-line played to the near post, Liam Dickinson makes a clearance. Correction - 81:19 Glenn Murray concedes a free kick for a foul on Ashley Young. Direct free kick taken by Bradley Guzan. 81:19 Glenn Murray concedes a free kick for a foul on Ashley Young. Bradley Guzan takes the direct free kick. 80:39 Free kick awarded for an unfair challenge on Adam Virgo by Nathan Delfouneso. Direct free kick taken by Michel Kuipers. 79:23 Dean Cox delivers the ball. 79:01 The ball is delivered by Sebastien Carole, clearance by James Collins. 78:44 Centre by Dean Cox, clearance made by Nathan Delfouneso. 78:25 Corner from the right by-line taken by Dean Cox, James Collins makes a clearance. 78:13 Sebastien Carole takes a shot. Save by Bradley Guzan. 76:53 The ball is swung over by Ashley Young. 76:44 Free kick awarded for a foul by Inigo Calderon on Stewart Downing. Free kick taken by James Collins. 75:55 Inigo Calderon produces a cross, Steve Sidwell makes a clearance. Correction - 73:20 Substitution Alan Navarro leaves the field to be replaced by Dean Cox. Correction - 73:20 Glenn Murray challenges Steve Sidwell unfairly and gives away a free kick. James Collins takes the free kick. 73:20 Substitution Alan Navarro goes off and Dean Cox comes on. 73:20 Glenn Murray gives away a free kick for an unfair challenge on Steve Sidwell. James Collins takes the direct free kick. 71:44 Glenn Murray has an effort from just inside the box that misses to the left of the goal. 71:15 Free kick awarded for an unfair challenge on Liam Dickinson by Luke Young. Sebastien Carole crosses the ball from the free kick right-footed from right wing, Curtis Davies makes a clearance. 69:49 Centre by Ashley Young. 68:07 The ball is delivered by Ashley Young, Close range shot by Fabian Delph goes wide of the right-hand upright. 67:23 The ball is sent over by Glenn Murray, comfortable save by Bradley Guzan. 64:13 Substitution Liam Dickinson comes on in place of Elliott Bennett. 64:13 Substitution (Brighton) makes a substitution, with Sebastien Carole coming on for Gary Dicker. 62:06 Assist on the goal came from James Milner. 62:06 GOAL - Fabian Delph:Aston Villa 3 - 1 Brighton Fabian Delph grabs a goal from just outside the penalty area to the bottom right corner of the goal. Aston Villa 3-1 Brighton. 61:20 The assistant referee flags for offside against Ashley Young. Adam Virgo restarts play with the free kick. 60:52 The ball is delivered by Stewart Downing, Michel Kuipers makes a save. 59:23 Elliott Bennett concedes a free kick for a foul on Ashley Young. Free kick taken by James Collins. 57:08 Corner taken right-footed by Ashley Young, Effort on goal by Ashley Young from just inside the box goes harmlessly over the target. 55:49 The ball is sent over by James Milner, Fabian Delph takes a shot. Save made by Michel Kuipers. 54:48 Corner taken by James Milner, save made by Michel Kuipers. 52:58 Unfair challenge on Gary Dicker by Curtis Davies results in a free kick. Elliott Bennett fires a strike on goal direct from the free kick. 52:25 Foul by Curtis Davies on Nicky Forster, free kick awarded. Direct free kick taken by Inigo Calderon. Correction - 51:33 The referee blows for offside against Glenn Murray. Indirect free kick taken by Bradley Guzan. 51:33 The official flags Glenn Murray offside. Habib Beye restarts play with the free kick. 50:59 The assistant referee flags for offside against Ashley Young. Free kick taken by Michel Kuipers. 49:53 Substitution Stephen Warnock leaves the field to be replaced by Curtis Davies. 49:44 Elliott Bennett has a shot on goal from outside the box which misses right. 47:37 The assist for the goal came from Stewart Downing. 47:37 GOAL - Ashley Young:Aston Villa 2 - 1 Brighton Ashley Young finds the net with a headed goal from close in. Aston Villa 2-1 Brighton. Correction - 47:17 The ball is crossed by Elliott Bennett, save made by Bradley Guzan. Correction - 46:08 Stewart Downing crosses the ball, clearance by Tommy Elphick. 45:17 A cross is delivered by Elliott Bennett, Bradley Guzan makes a save. 45:08 Stewart Downing delivers the ball, clearance by Tommy Elphick. 45:00+1:24 It is the end of the first-half. 44:39 Adam Virgo takes the direct free kick. 44:39 Booking James Collins goes into the referee's book for unsporting behaviour. 44:32 Unfair challenge on Glenn Murray by James Collins results in a free kick. 44:22 The ball is delivered by Stephen Warnock, clearance made by Jim McNulty. 42:36 Stewart Downing takes the inswinging corner, save by Michel Kuipers. 42:26 James Milner sends in a cross, Jim McNulty gets a block in. 40:59 GOAL - Tommy Elphick:Aston Villa 1 - 1 Brighton Tommy Elphick scores a goal from close in to the bottom right corner of the goal. Aston Villa 1-1 Brighton. 40:03 Elliott Bennett takes the outswinging corner, clearance by Nathan Delfouneso. 38:51 Inswinging corner taken right-footed by Ashley Young played to the near post, clearance by Glenn Murray. 38:23 The ball is sent over by James Milner, save made by Michel Kuipers. 37:34 The offside flag is raised against Glenn Murray. Indirect free kick taken by Bradley Guzan. 36:47 Free kick awarded for an unfair challenge on Glenn Murray by James Collins. The free kick is delivered left-footed by Jim McNulty from right channel, clearance made by Stephen Warnock. 36:09 Nathan Delfouneso gives away a free kick for an unfair challenge on Adam Virgo. Michel Kuipers restarts play with the free kick. 33:55 The ball is sent over by Jim McNulty, clearance by Habib Beye. 30:20 Corner taken by James Milner from the right by-line, Foul by James Collins on Tommy Elphick, free kick awarded. Michel Kuipers takes the direct free kick. 27:39 The ball is crossed by Stephen Warnock. 24:09 Stephen Warnock crosses the ball. 22:14 The ball is sent over by James Milner, Adam Virgo manages to make a clearance. 21:33 The ball is sent over by Elliott Bennett, Habib Beye manages to make a clearance. 14:56 Stewart Downing has an effort direct from the free kick. 14:56 Booking Alan Navarro receives a caution. 14:50 Unfair challenge on Fabian Delph by Alan Navarro results in a free kick. 13:53 Nicky Forster produces a right-footed shot from just outside the penalty area that goes harmlessly over the target. 12:59 Substitution James Milner is brought on as a substitute for Marc Albrighton. 6:58 Nathan Delfouneso sends in a cross. 4:55 Marc Albrighton provided the assist for the goal. 4:55 GOAL - Nathan Delfouneso:Aston Villa 1 - 0 Brighton Nathan Delfouneso fires in a goal from close in to the bottom left corner of the goal. Aston Villa 1-0 Brighton. 3:26 Nicky Forster produces a cross, clearance made by Luke Young. 1:18 A cross is delivered by Ashley Young, Elliott Bennett manages to make a clearance. 1:08 Ashley Young delivers the ball, clearance by Jim McNulty. 0:41 Corner taken right-footed by Ashley Young from the left by-line to the near post, save by Michel Kuipers. 0:18 Luke Young takes a shot. Michel Kuipers makes a save. Correction - 0:00 The game gets underway.